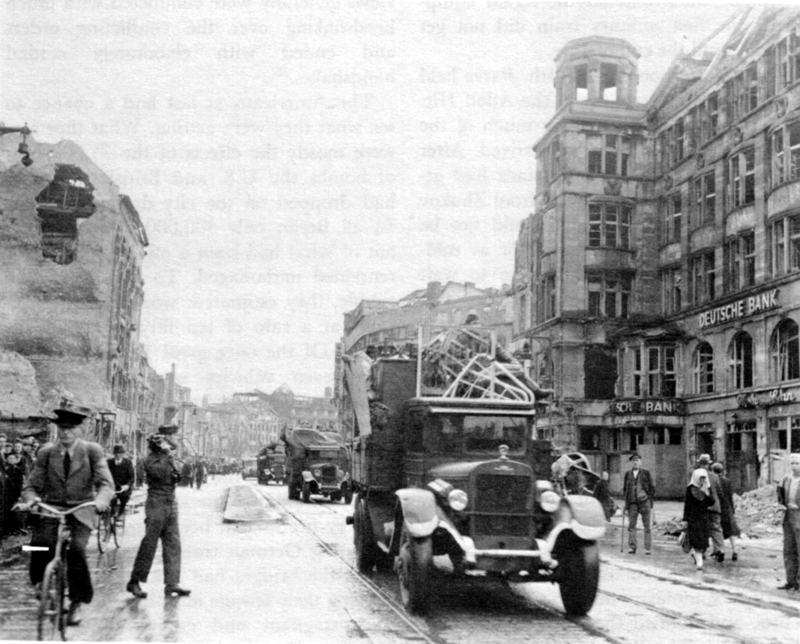 On the return flight the next afternoon, Parks followed the Berlin-Halle Autobahn looking for the truck convoy of the Preliminary Reconnaissance Party for Berlin. It was supposed to have crossed the Elbe early in the morning and should have reached Babelsberg before he left. When he spotted the head of the column, it was three miles east of the Elbe and still fifty-five miles away from Berlin. Colonel Howley, commanding the convoy, had reached the Elbe bridge at Dessau in the morning on time. With him he had 100 trucks, the 136 enlisted men and 85 officers of his Detachment A1A1, and several dozen officers and 175 enlisted men detailed to work at the conference site. At the bridge, the Russians had refused to pass more than 50 trucks, 37 officers (actually a total of 50 but minus the officers with Parks), and 175 enlisted men-the exact number specified in the instructions from Moscow. Howley, after arguing with successive Soviet generals for seven hours, had finally crossed the river with the numbers the Russians stipulated. He had left A1A1 behind, which made him and three other officers the only military government personnel in the part of the convoy allowed to continue. General Clay and Lt. Gen. Sir Ronald Weeks, Montgomery's deputy military governor, went to Berlin on the 29th to confer with Marshal Zhukov. Zhukov, whom Clay afterwards described as cordial but unpredictable, demonstrated both qualities at the outset.13 He accepted the agenda Clay and Weeks had brought with them as the basis for discussion and turned at once to the first point, which concerned arrangements for the US and British forces to enter and take over their sectors in Berlin. After some desultory discussion about how many troops the Western Allies would bring in, however, he asked how long the Americans would take to evacuate the parts of the Soviet zone they held. When Clay said the plan was to begin on 1 July and to complete the turnover in nine days, Zhukov wanted to know why it would take so long. The Soviet forces, he said, could take over the entire area in twenty-four hours, and, he added, the quicker the move out of the zone, the quicker the Western Allies could enter Berlin. Coldly, he let it be seen that what was important for him was a trade: the approximately 16,400 square miles of the Soviet zone that SHAEF held in exchange for the 185 square miles of the western sectors in Berlin. Obviously not expecting SHAEF to agree to so lopsided an exchange if it could be avoided, he furthermore specified that reconnaissance parties might enter Berlin on 1 July but that the main body of the occupation troops would have to wait until the day the movement out of the Soviet zone was completed. When Clay asked why, if the US forces released a third of the territory they held to the Soviet forces on the first day, one-third of the Berlin force could not move in on that day, Zhukov simply replied that such an arrangement was impossible. The most he would allow, after Clay had agreed to the complete US evacuation of the Soviet zone by midnight on 4 July, was that the US and British forces could begin moving across the Soviet zone toward Berlin on the 3d. Howley, after his Babelsberg trip, had requisitioned a farm outside Halle, and he planned to move Detachment A1A1 into camp there on Sunday, 1 July. On Saturday, he received orders to proceed to Berlin instead. In the morning, in battle dress and with full field packs, the detachment headed east across the Elbe. The convoy moved through the Russian control points without a hitch, and by nightfall, A1A1 was bivouacked in the Grunewald, the parklike wooded area on the southwestern outskirts of Berlin. On Monday morning, Parks, Howley, and Maj. Gen. Lewis O. Lyne, the British Berlin district commander, met Col. Gen. Aleksandr V. Gorbatov, the Soviet city commandant, at his headquarters. In spite of some stiffness-most of the morning was spent just trying to reach Gorbatov by telephone-the meeting resulted in two important decisions: that the U.S. sector would comprise six boroughs (herzvaltungsbezirke) in the southwestern part of the city, Zehlendorf, Steglitz, Tempelhof, Schoeneberg, Kreuzberg, and Neukoelln; and that the Americans would assume control in their sector at midnight on 4 July. Gorbatov agreed to allow US military government officers to reconnoiter the boroughs they would control and, after the tour, invited the British and Americans to a tea, which turned out to be a full-course dinner. 17 The Russians accepted Parks' invitation to a formal ceremony of occupation to be held by the US forces in Berlin on the afternoon of the 4th. ALLIES MEET IN BERLIN. 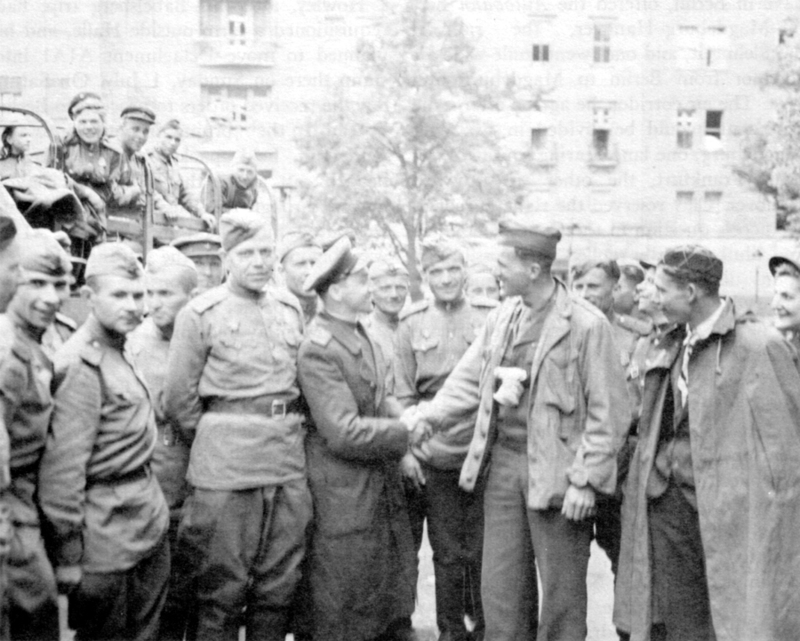 Soviet troops greet Signal Corps photographer who was one o f the first Americans into the city on 4 July 1945.
away one track and all the signal equipment; the first military train did not get through until the end of July. The Americans at last had a chance to see what they were getting. What they saw were mostly the effects of the 75,000 tons of bombs the US and British air forces had dropped on the city during the war. In all Berlin only 300,000 dwelling units out of what had been a million and a half remained undamaged. To haul away the rubble, they estimated, would take sixteen years at a rate of ten fifty-car trainloads a day. Of the once great Berlin bus fleet, thirty-seven vehicles were still running. Steam engines were being used to haul the streetcars to save electricity, and less than a tenth of the subway cars were operable. The bridges over the city's many canals had nearly all collapsed under the bombing and artillery fire or had been blown up by the retreating German troops. Sewers hanging under the bridges had fractured and were pouring their sewage into the canals, which were stagnant and covered with scum, breeding places for billions of flies and mosquitos. Graves marked by crude wooden crosses could be seen everywhere, even in the public squares and along the streets; and thousands of corpses lay unburied under the rubble. The people were getting 64 percent of a 1,240-calorie daily ration. 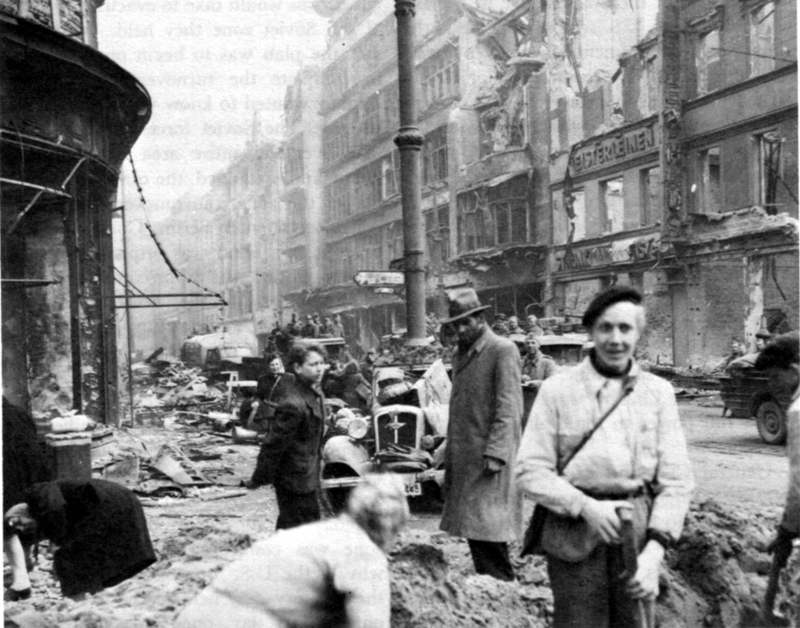 The Russians had put Germans, mostly women, to work on the mountains of rubble, using some debris to fill in the craters in the streets and arranging the rest in less obtrusive patterns. Clay, Murphy, Parks, Howley, and a battery of interpreters went, together with their British counterparts, to talk to Zhukov in the Soviet headquarters in Berlin-Pankow on the 7th. The spirit of the meeting was not at all friendly. Zhukov said he was willing to set up the Kommandatura, but there were matters of food and fuel supplies to be settled before the Soviet authorities turned over the western sectors. The Americans and British were going to occupy their sectors and in doing so, he said blandly, they would also have to assume responsibility for feeding the people. According to his figures there were nearly 800,000 Germans in the American sector and 900,000 in the British sector, and they would require 40,000 tons of food per month. Berlin's normal supply system, he maintained, had broken down completely and was not likely to be restored soon. He also insisted on the Western Allies' supplying nearly all the city's coal, because, he claimed, Upper Silesia, formerly the chief source of coal for Berlin, had been transferred to Polish control and was no longer part of Germany. Since the British and Americans had expected to get food for their zones from the primarily agricultural eastern zone, and not to have to ship it there, and since neither the United States nor the United Kingdom had recognized the Soviet transfer of Upper Silesia to Poland, the western representatives, badly shaken, broke off the meeting to consult their governments. Military government called the operation "rolling the carpet." The tactical commands used the term "redisposition" to avoid "redeployment," which was reserved for the troop movements from Europe to the war in the Pacific. For both, the withdrawal to the final US occupation zone was a massive job. On V-E Day, the US forces held 43 percent (78,000 square miles) of the area within the 1937 German boundaries, which was the whole (with minor exceptions) of the assigned US zone (41,400 square miles) plus an area almost as large in the British and Soviet zones.24 The carpet would have to be rolled and the tactical units redisposed from the west, east, north, and south, and within the zone the boundaries of Third and Seventh Armies would have to be readjusted, before the armies could become the military district commands. The obscure behavior of the Russians and belated decision on the boundaries of the French zone added complications. The trouble was most serious in the lower level detachments, which suggests that the weakness was not inherent in Colonel Hunt's vision of a trained military government force but rather in the World War II interpretation of it, which insisted on equal preparation at all levels and resulted in overtraining, overorganization, and underemployment. Settling military government into the Eastern Military District posed no problems. The district and the Bavarian Land boundaries coincided, and all of Bavaria was in the US zone. When the Land detachment established itself in Munich and E and F detachments took over the major political subdivisions, the framework for regional control was complete. One of the earliest lessons of World War II was the potential crucial importance of technology. From the beginning the governments-fortunately the Allies more than the Germans-expected scientific and technical proficiency to influence heavily and perhaps even decide the outcome of the war. A new scientific device or a new industrial process, they believed, could be worth divisions or even armies; and battles, perhaps even the war, could be won or lost in the laboratory or factory. In occupied enemy territory, scientific and technical intelligence might reveal the state of the enemy's advancement in particularly dangerous areas such as atomic fission and might uncover processes or devices that could be converted to Allied use. During the planning for the invasion SHAEF set up the T (Target) Sub-Division in G-2 to plan for intelligence exploitation of scientific and industrial targets. It was at first composed of five US and three British officers and thirteen enlisted men and women. In February 1945, on the eve of the advance into Germany, SHAEF created the Special Sections Subdivision to co-ordinate the operations of the T Subdivision and several other G-2 sections and subdivisions with related missions. T Subdivision, meanwhile, had acquired a field element, the 6800 T Force, which would reach a 1,700-man strength in April and, with the later addition of the GOLDCUP ministerial control parties, went well over 2,000. During May and June, the force put another 1,000 investigators into the field. Among its high priority targets the T Force listed synthetic rubber and oil catalysts, new designs in armored equipment, V (rocket) weapons, jet and rocket propelled aircraft, naval equipment, field radios, secret writing chemicals, aero medicine research, gliders, and "scientific and industrial personalities." 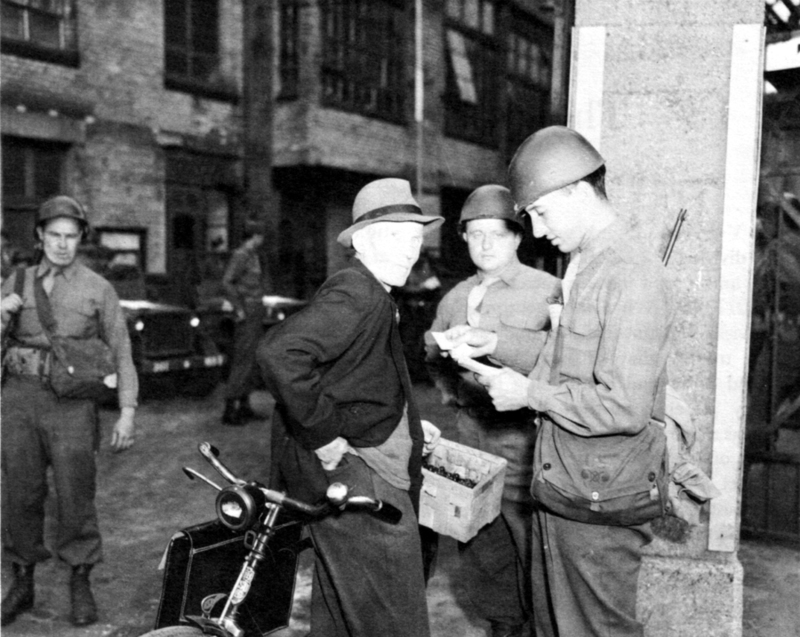 During the drive into Germany and the first weeks after the surrender, T Force examined some 3,000 planned targets and uncovered 2,000 others. The grand prize target, of course, was the Mittelwerk, the V-2 plant at Nordhausen; but to the scientific and technical specialists, documents, patent records, optical devices, high pressure pumps, gear grinders, tire cord twisters, and supersonic wind tunnels were often almost as sensational. When large numbers of German scientists and economic and industrial experts began to be discovered in late April, Special Sections Subdivision set up the Enemy Personnel Exploitation Section to manage and interrogate them. For its most important charges, the Enemy Personnel Exploitation Section established a detention center, DUSTBIN, first in Paris and later in Kransberg Castle outside Frankfurt. DUSTBIN was the scientific and industrial-economic counterpart of ASHCAN, and some of its inmates, such as Albert Speer and Hjalmar Schacht, were candidates for both centers. working with Dr. Bowles in carrying out the mission from the Secretary of War. Since the new organization would have to be combined for as long as SHAEF existed, Clay had selected as its chief Brig. R. J. Maunsell (British), who was already chief of the Special Sections Subdivision, and as the deputy chief Col. Ralph M. Osborne (US). Clay also gave the organization a name, Field Information Agency, to which Maunsell added the word "Technical" to make a pronounceable acronym, FIAT. FIAT was from the first conceived as a posthostilities agency. It would inherit from the Special Sections Subdivision a military mission and, in the search for information to use against Japan, also a wartime mission; but in the long run it would be oriented at least equally toward civilian interests. Chief among its interests would be "the securing of the major, and perhaps only, material reward of victory, namely, the advancement of science and the improvement of production and standards of living in the United Nations by proper exploitation of German methods in these fields." 56 FIAT's scope was therewith extended to take in scientific and industrial processes and patents having civilian as well as military applications. technical intelligence were redeployed beginning in the late summer, FIAT frequently also became the custodian of the documents and equipment they had collected. SHAEF's wartime mission ended on V-E Day. The last residual mission, the redisposition into the zones, was completed on 10 July, and the Supreme Command terminated on the 14th. Headquarters, USFET, under Eisenhower as Theater Commander and Smith as Chief of Staff, had opened in Frankfurt on 1 July; and when its increments from ETOUSA, SHAEF, and 12th Army Group were fully assembled, it was, with 3,885 officers and 10,968 enlisted men, an imposing organization in its own right. USFET commanded only US troops, but its sphere of responsibility extended outside the zone in Germany into England, France, Belgium, Norway, and Austria. 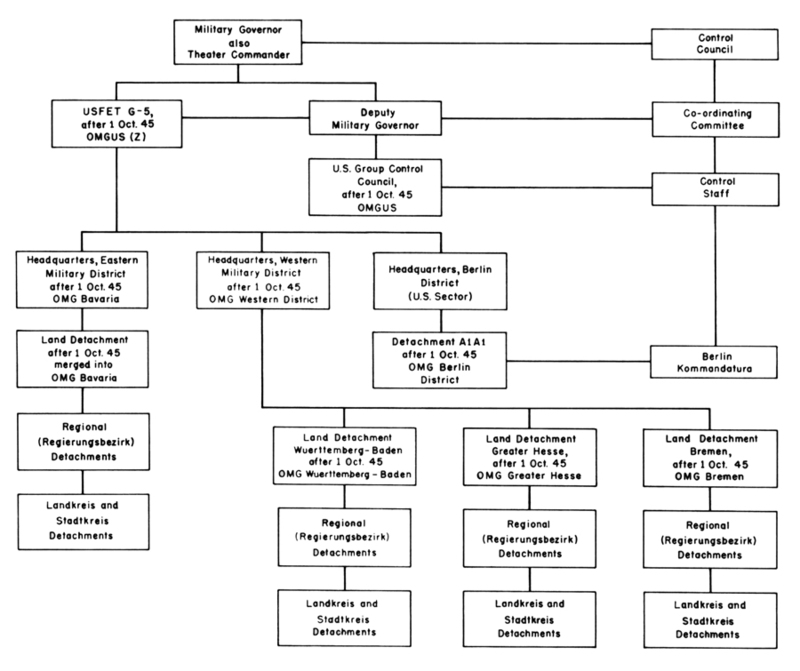 Two military government staffs, the US Group Control Council and the theater G-5, would provide the US element of the quadripartite administration for Germany and govern the zone. The 12th Army Group ceased its operations on 25 July, and thereafter USFET also assumed direct command of the occupation forces.